Om (also spelled Aum) is a Hindu sacred sound that is considered the greatest of all mantras. Thus Om mystically embodies the essence of the entire universe. This meaning is further deepened by the Indian philosophical belief that God first created sound and the universe arose from it. As the most sacred sound, Om is the root of the universe and everything that exists and it continues to hold everything together. The syllable is discussed in a number of the Upanishads, which are the texts of philosophical speculation, and it forms the entire subject matter of one, the Mandukya. The essence of all beings is the earth. The essence of the earth is water. The essence of water is the plant. The essence of the plant is man. The essence of man is speech. The essence of speech is the Rigveda. The essence of Rigveda is the Samveda. In the Puranas the syllable Om became associated in various ways with the major Hindu devotional sects. Saivites mark the lingam (a symbol of Shiva) with the symbol for Om, while Vaishnavites identify the three sounds as referring to the trinity of Vishnu, his wife Sri, and the worshiper. Om is spoken at the beginning and the end of Hindu mantras, prayers, and meditations and is frequently used in Buddhist and Jain rituals as well. Om is used in the practice of Yoga and is related to techniques of auditory meditation. From the 6th century, the written symbol of Om was used to mark the beginning of a text in a manuscript or an inscription. Om Parvat, a sacred peak at 6191m in the Indian Himalayas, is revered for its snow deposition pattern that resembles Om. With its threefold nature, special shape and unique sound, Om lends itself to a variety of detailed symbolic interpretations. The symbol of AUM consists of three curves (curves 1, 2, and 3), one semicircle (curve 4), and a dot. The large lower curve 1 symbolizes the waking state (jagrat), in this state the consciousness is turned outwards through the gates of the senses. The larger size signifies that this is the most common ('majority') state of the human consciousness. The upper curve 2 denotes the state of deep sleep (sushupti) or the unconscious state. This is a state where the sleeper desires nothing nor beholds any dream. The middle curve 3 (which lies between deep sleep and the waking state) signifies the dream state (swapna). In this state the consciousness of the individual is turned inwards, and the dreaming self beholds an enthralling view of the world behind the lids of the eyes. These are the three states of an individual's consciousness, and since Indian mystic thought believes the entire manifested reality to spring from this consciousness, these three curves therefore represent the entire physical phenomenon. The dot signifies the fourth state of consciousness, known in Sanskrit as turiya. In this state the consciousness looks neither outwards nor inwards, nor the two together. It signifies the coming to rest of all differentiated, relative existence This utterly quiet, peaceful and blissful state is the ultimate aim of all spiritual activity. This Absolute (non-relative) state illuminates the other three states. Finally, the semi circle symbolizes maya and separates the dot from the other three curves. Thus it is the illusion of maya that prevents us from the realization of this highest state of bliss. The semi circle is open at the top, and when ideally drawn does not touch the dot. This means that this highest state is not affected by maya. Maya only affects the manifested phenomenon. This effect is that of preventing the seeker from reaching his ultimate goal, the realization of the One, all-pervading, unmanifest, Absolute principle. In this manner, the form of OM represents both the unmanifest and the manifest, the noumenon and the phenomenon. As a sacred sound also, the pronunciation of the three-syllabled AUM is open to a rich logical analysis. The first alphabet A is regarded as the primal sound, independent of cultural contexts. It is produced at the back of the open mouth, and is therefore said to include, and to be included in, every other sound produced by the human vocal organs. Indeed A is the first letter of the Sanskrit alphabet. The open mouth of A moves toward the closure of M. Between is U, formed of the openness of A but shaped by the closing lips. Here it must be recalled that as interpreted in relation to the three curves, the three syllables making up AUM are susceptible to the same metaphorical decipherment. The dream state (symbolized by U), lies between the waking state (A) and the state of deep sleep (M). Indeed a dream is but the compound of the consciousness of waking life shaped by the unconsciousness of sleep. AUM thus also encompasses within itself the complete alphabet, since its utterance proceeds from the back of the mouth (A), travelling in between (U), and finally reaching the lips (M). Now all alphabets can be classified under various heads depending upon the area of the mouth from which they are uttered. The two ends between which the complete alphabet oscillates are the back of the mouth to the lips; both embraced in the simple act of uttering of AUM. The last part of the sound AUM (the M) known as ma or makar, when pronounced makes the lips close. This is like locking the door to the outside world and instead reaching deep inside our own selves, in search for the Ultimate truth. But over and above the threefold nature of OM as a sacred sound is the invisible fourth dimension which cannot be distinguished by our sense organs restricted as they are to material observations. This fourth state is the unutterable, soundless silence that follows the uttering of OM. A quieting down of all the differentiated manifestations, i.e. a peaceful-blissful and non-dual state. 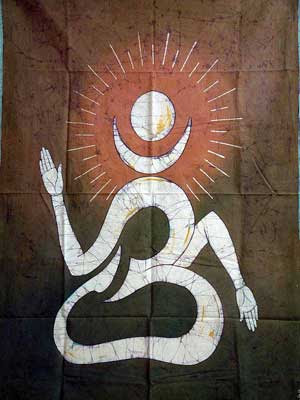 Indeed this is the state symbolized by the dot in the traditional iconography of AUM. The threefold symbolism of OM is comprehensible to the most 'ordinary' of us humans, realizable both on the intuitive and objective level. This is responsible for its widespread popularity and acceptance. That this symbolism extends over the entire spectrum of the manifested universe makes it a veritable fount of spirituality. According to Indian spiritual sciences, God first created sound, and from these sound frequencies came the phenomenal world. Our total existence is constituted of these primal sounds, which give rise to mantras when organized by a desire to communicate, manifest, invoke or materialize. Matter itself is said to have proceeded from sound and OM is said to be the most sacred of all sounds. It is the syllable which preceded the universe and from which the gods were created. It is the "root" syllable (mula mantra), the cosmic vibration that holds together the atoms of the world and heavens. Indeed the Upanishads say that AUM is god in the form of sound. Thus OM is the first part of the most important mantras in both Buddhism and Hinduism, e.g. Om Namoh Shivai and Om Mani Padme Hum. Another ancient text equates AUM with an arrow, laid upon the bow of the human body (the breath), which after penetrating the darkness of ignorance finds its mark, namely the lighted domain of True Knowledge. Just as a spider climbs up its thread and gains freedom, so the yogis climb towards liberation by the syllable OM. The omnific and omniparous quality of OM makes it omnipresential, and in-omissible from any spiritual practice. As an omnipotent symbol, the yogi who penetrates its mystery is indeed truly omnicompetent and omnipercipient, and as an omniscient source, it is a virtual omnibus of sacred and mystical inspirations. Hello friend! Do you have a way I can contact you? I wanted to share with you a picture of my new tattoo that was inspired by the design of the OHM(OM) picture you posted! Thanks!